By Catherine Clinton, Harper Collins. Ages 4-8. There are many great stories in American history that are seldom or never told. This tale of the African-American soldiers that gave their lives for freedom during the Civil War is one of them. 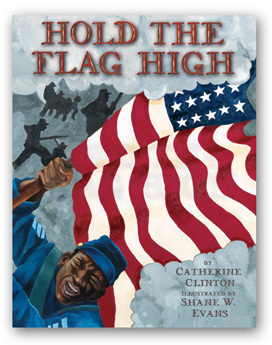 Hold the Flag High tells the heroic story of William H. Carney, of the 54th regiment, and the brutal battle that took place in July 1868. This is a stunning book and a wonderful piece of history resurrected by Catherine Clinton.